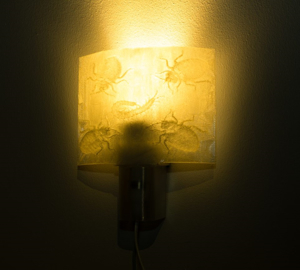 3D printed plastic (PLA) night lamp with your favorite picture. The picture can be for example your child's favorite character or own face in embossed picture. Do you need a 2 watt led bulb? Add the photo or logo that you want. If you want us to design a picture for you, add a sketch or similar picture. This nice custom picture night lamp if a good gift for a child or a loved one. You can add almost any kind of picture that has a strong profile. Please attach the picture that you want in the order. This product includes a factory made CI accepted E14 lamp base, on/off switch and power cord. Note: PLA can handle only about 100C heat so it is not allowed to use more than 2-4 W led lamp with this lamp cover (it has the same light power as an old fashioned 40W light bulb).